Kyle Busch is the winningest driver in all three of NASCAR's top series at Bristol Motor Speedway. On Wednesday night, the 17-time winner at The Last Great Colosseum will captain an arsenal of young talent in pursuit of victory in the UNOH 200 NASCAR Camping World Truck Series race. Busch, who has scored four Truck Series victories at BMS over the years, will drive his team's No. 46 truck, while the series points leader, red-hot Christopher Bell will be at the controls of his No. 4 Toyota Tundra, rising star Noah Gragson will drive the flagship No. 18 and second-generation driver Harrison Burton will make his Bristol Truck debut in the cockpit of the team's No. 51. Bell, who is having a season to remember with four victories and three poles, comes to BMS with the series lead after finishing second in an exciting Michigan race last weekend where he, eventual winner Bubba Wallace and Austin Cindric put on quite a show in the closing laps. "I'm just so thankful to be able to drive this thing," Bell said. "It's a dream come true to be able to compete in NASCAR and to be able to drive for Toyota and Kyle Busch Motorsports. It's just a dream come true." 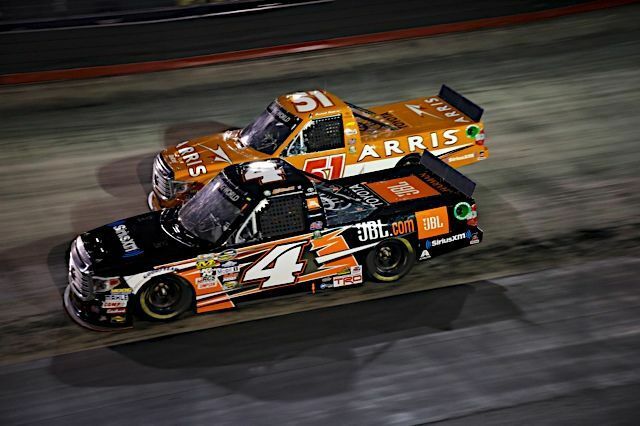 Last year Bell finished seventh in his only Truck start at BMS, after leading 101 laps. He is expecting more good things this time around when he hits the track for the estimated 8:45 p.m. start Wednesday evening at the famed Northeast Tennessee high-banked oval. FS1 will provide television coverage of the race, while MRN will call the action on radio. "I love short track racing, and Bristol is just a ton of fun," Bell has said. "Bristol is such a high-speed short track with a lot of banking. You're not able to run around there wide-open, so you are always having to manipulate your truck to make it do what you want it to do. I just like places where a driver can really make a difference." Meanwhile, Jeff Burton's son Harrison, who has had success in the NASCAR K&N Series and in Super Late Model racing, will make his first go in the Trucks at BMS. It will be his fifth start of the season for KBM. He will try to better his career best finish of 11th, which came at Iowa in late June. "Bristol is one of my favorite tracks to race at and I feel like it's also one of my best tracks," said Burton, who won the K&N race at Bristol in April. "Getting my first K&N win there was so exciting and I learned so much about the track in that race. I'm hoping I can take my skills and get my No. 51 DEX Imaging Tundra dialed in and compete for my first NCWTS win there as well." Gragson is another young driver who will be making his first Truck start at Bristol, but did get some seat time here earlier this year when he competed in the Short Track U.S. Nationals in a Super Late Model. The rookie contender has had a strong first full season in the KBM No. 18, posting nine top 10 finishes and two poles. He is still looking for his first win as he tries to improve on his ninth place points finish at the Playoffs draw closer. Gragson says taking a lap at speed around "The World's Fastest Half-Mile" is like nothing he's experienced in his young career. "Racing at Bristol reminds me of that Gravitron ride at the state fair," Gragson said. "You go inside, lay up against the wall and it starts spinning you around really fast and the gravity holds you against the wall so you can't move. That's what it feels like to go around Bristol. Your head is pinned to the right side of the headrest because there are so many G-forces from the high speeds and banking. It's utter chaos and you are always racing someone side by side, whether for the lead, or 15th place or a lapped car. That's what makes it so difficult." Other stars to watch in the Camping World Truck Series event include second place driver Johnny Sauter, Matt Crafton, Chase Briscoe, Ryan Truex, Ben Rhodes, Cindric, John Hunter Nemecheck and Grant Enfinger. In Saturday night's Bass Pro Shops NRA Night Race, Dale Earnhardt Jr., who will also compete in Friday night's Food City 300 XFINITY Series race during his final weekend at the legendary Tennessee half-mile, will battle for the victory alongside many more of NASCAR's elite drivers in the Bass Pro Shops NRA Night Race, including defending winner Kevin Harvick, seven-time Monster Energy Cup champ Jimmie Johnson, young guns Kyle Larson, Chase Elliott, Erik Jones, two-time season winner Ricky Stenhouse Jr., Daniel Suarez, Ryan Blaney, and Austin and Ty Dillon, along with veteran drivers Clint Bowyer, Kyle Busch, Keselowski, Denny Hamlin, Indy winner Kasey Kahne, Kenseth and Martin Truex Jr. In addition to watching some of the greatest racing on the NASCAR circuit, there are so many cool options to make a complete weekend of family fun, including great video entertainment provided by Colossus, the world's largest center-hung video screen, lots of party zones like the Bristol Lawn Party, premium VIP experiences like the Chairman's Experience, tailgating, on-site camping, concerts, great food and beverages in the concession stands throughout the property, and so much more. And for families who want to bring the entire clan, Bristol Motor Speedway officials are making it easier than ever for kids to have an awesome experience. Kids' tickets (12 and under) are free and adult tickets are $30 for Wednesday's UNOH 200 Camping World Truck Series race and the Bush's Beans 150 Whelen Modified Series race. Friday night's (Aug. 18) Pinty's Qualifying and Food City 300 XFINITY Series event features adult tickets starting at $35 and free kids tickets. On Saturday night (Aug. 19), kids' tickets are only $10 for the Bass Pro Shops NRA Night Race Monster Energy NASCAR Cup Series race, while adult tickets start at $69. For all races, each child must have a physical ticket in hand to enter the gates. The Bristol Motor Speedway ticket office and www.BristolTix.com are the only two authorized locations that can produce the free kids' tickets. To purchase tickets to the Bass Pro Shops NRA Night Race, please call 423-BRISTOL or buy them online at www.BRISTOLTIX.com. Tickets can also be purchased directly from any neighborhood Food City store.